At River Lake Clinic you and your loved ones can get the comprehensive eye care you need to enjoy a better quality of life. The eyes are a complex and integral part of the human body, and there are a variety of diseases and other conditions that could put your sight at risk. Visit our vision care center in the Longfellow/Cooper neighborhood of Minneapolis, Minnesota, when you need a practice focused on your vision needs. Don’t assume that a lack of symptoms means your eyesight is fine. There is a host of different diseases and conditions that could be affecting your eyes without demonstrating any early symptoms. This is why regular annual eye exams can be so valuable at preserving your vision. Keeping your eyes healthy is easy when you focus on preventative care. In addition to scheduling annual checkups for everyone in the family, take advantage of our learning resources and avoid things like digital eye strain. Our optometrists have built a reputation for subject-area specialization and quality care that puts the patient first. Discover the difference that comes from working with a reputable eye care provider like River Lake Clinic LLC. 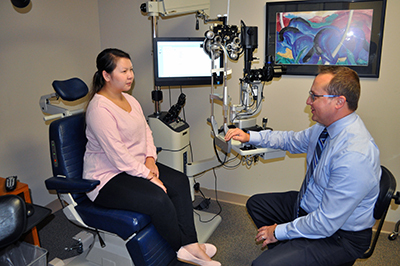 When major organizations like the Minnesota Department of Transportation, Metro Transit, Veterans Affairs and academic groups need experienced optometrists and legal consultations regarding vision or medical-legal opinions regarding eye conditions, they turn to River Lake Clinic, LLC. Dr. Mike has assisted the Minnesota Department of Transportation with highway design and safety. He has also lectured on topics ranging from glaucoma to the treatment of keratoconus and corneal scars, vitreo-retinal traction and maculopathies. Dr. Josh has been selected as a nation-wide speaker for dry-eye disease. When it comes to the quality of you and your family’s eyesight, why choose a vision clinic that wants to rush you out the door. Make the right choice for a future of quality vision by choosing our office the next time you are ready for an exam. For 40 years we have been working with residents of the Twin Cities community to help them with improved sight and eye health. At our practice, we understand that caring for your vision goes beyond simply selling you a flashy pair of frames. Our team is focused on providing you with medical optometry that detects and treats early signs of sight threatening conditions, including glaucoma, macular degeneration, and diabetic eye diseases. Catching signs of these conditions early helps us extend the longevity of your vision. Choose one clinic capable of addressing every issue your eyes may be facing. Don’t wait until it is too late to protect your vision. Our comfortable office will immediately put you at ease, and the examination will be thorough and painless. Take advantage of our optical services the next time you need new frames and lenses. Contact us today to avoid eye strain and other health issues with our routine eye care. We proudly serve patients in the Twin Cities of Minneapolis and St. Paul, Minnesota, and surrounding communities.